Australia coach Justin Langer insisted Tim Paine is "100 per cent ready to go" as he dismissed concerns over the captain's fitness heading into the second Test against India. Paine suffered a blow to his troublesome right index finger in Australia's dramatic 31-run loss to India in Adelaide on Monday, an incident the skipper later played down. The wicketkeeper has had several operations since breaking that finger in 2010, however, Langer allayed fears ahead of the Perth Test, starting Friday. "He is the toughest pretty boy I've ever met in my life," Langer joked as he fronted the media on Tuesday. "He could have snapped it [his finger] in four places and he would be right. He is fine. "He has had issues with it before. But he is 100 per cent ready to go." 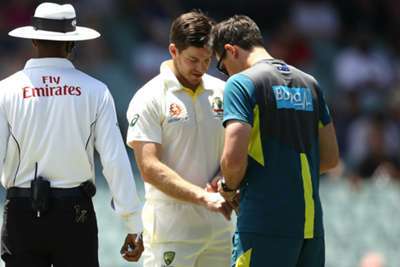 Australia head to Perth trailing 1-0 in the four-Test series and with questions over Mitchell Starc's form. Leading fast bowler Starc managed just 5-103 across India's two innings, sparking criticism, and Langer is hoping for a better performance from his attack. "We probably just felt short in not wearing down the Indian bowlers enough this Test match," he said. "It's going to be hot on Friday. Hopefully on a wicket which is conducive to a little bit of swing and seam, the bowlers will get the job done."